First, check in the book you are having trouble with. Then, power off your device for 30-45 seconds. Power back on and check the book back out. If there is a hold list, please contact your local library for hold list adjustment. If the error persists, confirm that the date and time on your device is current. Please go to the Adobe Reset page and fill out the form to the best of your ability. 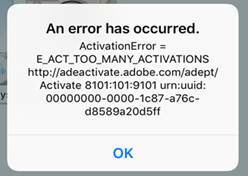 We will submit the request on your behalf to Adobe. First, check in the book you are having trouble with. Then, power off your device for 30-45 seconds. Power back on and check the book back out. If there is a hold, please contact your local library for hold list adjustment. First, uninstall the cloudLibrary application from your device. Then, power off the device for 30-45 seconds. Next, power back on your device. Lastly, reinstall the cloudLibrary app. 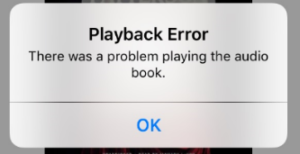 I'm receiving a Playback Error message. Tap OK to continue. If audio does not resume, log out of cloudLibrary and then log back in. 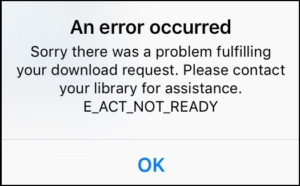 This will prompt the e-Audiobook to re-download.